Представлено результати аналізу загальнодержавних підходів до здійснення профорієнтаційної роботи серед молоді для вибору поліцейських спеціальностей, на цій основі виокремлено проблемні питання на кожному із профорієнтаційних напрямків (профінформація, профконсультація, профвідбір та профадаптація). Наголошено на наявності загальних і спеціальних недоліків в організації та проведенні профорієнтаційних заходів щодо професійного вибору взагалі та професій, пов’язаних зі службою в різних підрозділах Національної поліції України, зокрема. Rudoy K.N., 2015. Theoretical aspects of human resources management of police divisions [Teoretychni aspekty upravlinnia personalom u roboti pidrozdiliv politsii]. Pìvdennoukraïnsʹkij pravničij časopis – South Ukrainian Law Journal, No. 2, pp. 134-137. Vuiets P., 2018. Flow-out of personnel, crashed cars and manipulation with procurements. The audit of the National Police [Vidtik kadriv, pobyti avto ta makhinatsii z zakupivliamy. Shcho pokazav audyt Natspolitsii]. Glavcom. 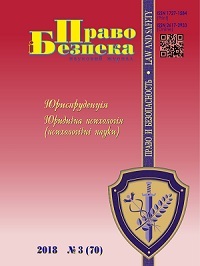 Available at https://glavcom.ua/publications/vidtik-kadriv-pobiti-avto-ta-mahinaciji-z-zakupivlyami-shcho-pokazav-audit-nacpoliciji-508345.html [Accessed 15 November 2018]. Ishchenko A., 2018. New police force and old problems: what is wrong with law enforcement reform [Nova politsiia i stari problemy: shcho ne tak z pravookhoronnoiu reformoiu]. Siohodni. Available at https://www.segodnya.ua/ukraine/novaya-policiya-i-starye-problemy-chto-ne-tak-s-pravoohranitelnoy-reformoy 1161735.html [Accessed 15 November 2018]. Kobzin D., Chernousov A., Koreneva K. and Kolokolova M., 2017. Monitoring of illegal violence within police force of Ukraine (2004-2017) [Monitorynh nezakonnoho nasylstva v politsii Ukrainy (2004-2017 rr.)]. Kharkiv: Kharkivskyi instytut sotsialnykh doslidzhen. P. 101. Puhach V.O., 2018. Qualification and competences in the system of training personnel for the National Police [Kvalifikatsiia ta kompetentnosti v systemi pidhotovky kadriv dlia Natsionalnoi politsii]. In: Pidhotovka politseiskykh v umovakh reformuvannia systemy MVS Ukrainy. Kharkiv, May 24, 2018. Kharkiv: KhNUVS. Pp. 29-32. Available at http://www.univd.edu.ua/general/publishing/konf/24_05_2018/pdf/5.pdf [Accessed 15 November 2018]. Khmelnytsky National University. Essence, structure and main concepts of vocational guidance [Sutnist, struktura ta poniattia profesiinoi oriientatsii]: lection. P. 3. Available at https://msn.khnu.km.ua/pluginfile.php/201156/mod_resource/content/0/%D0%9B%D0%B5%D0%BA%D1%86%D1%96%D1%8F%20%E2%84%961.pdf [Accessed 15 November 2018]. Vasylchenko V.S., Hrynenko A.M., Hrishnova O.A. and Kerb L.P., 2005. Management of labor potential [Upravlinnia trudovym potentsialom]. Kyiv: KNEU. Sakharov V.F. and Sazonov V.F., 1982. Vocational guidance of secondary school students [Professionalnaya orientatsiya shkol`nikov]. Moscow: Prosveshchenie. P. 15. Vitkovska O.I., 1998. Professional personal identity as an essential problem of a personality [Profesiine samovyznachennia yak zhyttieva problema osobystosti]. Pedagogìka ta psihologìâ – Pedagogics and psychology, No. 3, pp. 171-179. Tsilmak O.M., 2011. Professional genesis of criminal police specialists: theory and practice [Profesiohenez kompetentnosti fakhivtsiv kryminalnoi militsii: teoriia ta praktyka]. Odesa: RVV ODUVS. Sokurenko V.V., 2018. Perspectives for the optimization of the process of selecting candidates for training in higher educational institutions with specific learning conditions that train police officers [Perspektyvni napriamy optymizatsii protsesu vidboru kandydativ na navchannia do zakladiv vyshchoi osvity iz spetsyfichnymy umovamy navchannia, shcho hotuiut politseiskykh]. In: Pidhotovka politseiskykh v umovakh reformuvannia systemy MVS Ukrainy. Kharkiv, May 24, 2018. Kharkiv: KhNUVS. Pp. 44-47. Available at http://www.univd.edu.ua/general/publishing/konf/24_05_2018/pdf/9.pdf [Accessed 15 November 2018]. Zulunova G.V., 2011. Профориентационная работа в школе [Proforientatsionnaya rabota v shkole]. Načalʹnaâ škola – Start School, No. 5, pp. 31-34. Korolchuk M.S. and Krainiuk V.M., 2006. Theory and practice of professional psychological selection [Teoriia ta praktyka profesiinoho psykholohichnoho vidboru]. Kyiv: Nika-Tsentr. Prykhodko Yu.O., 2007. Analysis of the state of professional selection of the officers of rescue teams of the State Emergency Service of Ukraine at the current stage [Analiz stanu profesiinoho vidboru pozhezhnykh-riatuvalnykiv MNS Ukrainy na suchasnomu etapi]. Problems of extreme and crisis psychology [Problemy ekstremalnoi ta kryzovoi psykholohii], Iss. 2, pp. 161-171. Miloradova, N. (2018) Проблемні питання профорієнтації та професійного відбору кандидатів на службу в органи Національної поліції України, Право і безпека, 70(3), pp 27-34. doi: 10.32631/pb.2018.3.04.